In our March newsletter we explored the questionable use of screening mammography due to its limitations when imaging women younger than age 50. The data continues to show that utilizing mammography for women age 40-49 is NOT effective at saving lives and the previous recommendation to begin annual mammographic imaging starting at age 40 is challenged in the medical community. Breast density limits the effectiveness of a mammogram. Women have dense breast tissue for various reasons. Young women, almost by definition, have dense breast tissue as well as women on Hormone Replacement Therapy (HRT) or Bio-identical Hormone Replacement Therapy (BHRT). Some women have high breast density due to a genetic component. Other factors that influence breast density are environmental influences. Our world is becoming more estrogenic (fracking, GMO’s, pollutants, insecticides, etc) and this is (or will) contribute to the increased incidence of high breast density, thereby leading to increased risk for breast cancer. California is now the 5th state to have a “Breast Density Notification” law. Roughly 40% of the women who have mammograms have dense breast tissue. Because dense breast tissue appears white on a mammogram, and cancer also appears white, it can be difficult to see the cancer. A January 2011 study by the Mayo Clinic found that in women with dense breast tissue, 75 percent of cancer is missed by mammography alone. The risk for women with extremely dense breast tissue is five times greater than the risk for women with low breast density. Above: Example of before HRT (left) and after taking HRT. Lastly, a study published in JAMA in February 2013 reports that advanced breast cancer in young US women is increasing. Is DITI the answer? Can DITI fill the gap for the 40-49 year old women where mammography has shown to NOT be effective? 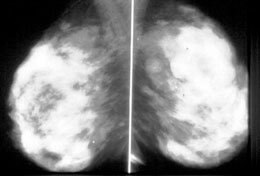 Can DITI add value to a mammogram for a woman with known dense breasts? Yes…and No. DITI does not image deep into the body looking for a tumor. DITI is NOT a test of structure, but of physiology (function). Physiologic changes occur within the body on average 6 to 8 years before the formation of a breast tumor. These are the changes DITI identifies which give proactive women an opportunity to intervene quickly. Many individuals, including allopathic doctors, do not understand thermography and compare it to mammography. The two technologies are not comparable, because mammograms only evaluate anatomy (structure) and cannot determine the physiologic nature (function) of what is seen. Evaluating physiology is the strength of digital infrared thermal imaging (DITI). DITI cannot replace mammography simply because it is NOT designed to detect what mammography detects: structure. Thermography watches for changes away from a previously established stable baseline. This is known as a “thermal fingerprint” and it is the foundation of these clinically useful images. One’s thermal fingerprint is remarkably stable over a lifetime. Only when pathology develops does the pattern change due to the abundance of neural pathways through which temperature regulation occurs. DITI detects physiologic changes (NOT inactive tumors) deep in the breast tissue, even though it only images the skin as the developing pathology affects the surrounding sympathetic neural fibers, which relay the message to the skin surface where the local temperature is measured. It is the shift away from one’s stable baseline that is the telltale sign of developing disease. If a woman is alerted to these physiologic changes, she can intervene much earlier and work with her practitioner to address diet, stress management, hormone status, vitamin deficiencies and other aspects of healthy living in an attempt to reverse/prevent the progression of disease. These physiologic changes offer women 6 to 8 years prior notice that disease may be developing before a tumor is found on a breast exam or mammogram. The effectiveness of thermography is NOT limited by breast density and therefore, is a phenomenal option for a young woman or any woman with a mindset of prevention. In an ideal world, where prevention is the goal, the best option would be for women to begin thermographic screening beginning at age 25 or 26 to establish a stable baseline. Annual visits will confirm stability and no new active, developing disease. Environmental influences on breast health (and overall health) are not diminishing. We believe it’s time to stop doing the same thing and expecting different (better?) outcomes. Prevention is the best option. This is where DITI can fill the gap.